For the last five years, I’ve been looking for a really great MIDI keyboard controller for my software and rackmounted instruments. Every year I would go to NAMM looking for a high-end MIDI controller and would come home disappointed. There’s no end of $10,000 electric guitars, but if you want a MIDI controller built for more than $600 then you’re out of luck. Sure I had a wish list. I wanted 88 weighted keys with pitch and mod wheels. I thought polyphonic aftertouch would be cool – individual pressure sensing per key to make one note sing out more than the others. Why does no one make such a thing? Probably because most people won’t buy such a thing – MIDI and fader controllers are traditionally slow sellers. Many people use digital pianos as controllers, but those are often missing performance controllers and the action can be too heavy for drums and synths. The rubber hammer hits this contact to play a note. Pressure is read by how much the hammer is compressed against it. used faders for keyboard and pressure sensitivity. The power supply needed a bit of work as well. The next problem was that the keys were very loose and wiggly. The felt bushings holding the wooden keys in place were completely dried and worn. This repair was well above my pay grade, so I found a piano technician to handle this for me. I hoped that the action would be heavier once he’d replaced those, but it was still lighter than an Alesis QS8 after the repairs. He added some additional weighting to the keys – still on the light side, but with some nice touch feedback. I wanted it to be light enough for rapid triggering of samples, percussion, and synths. 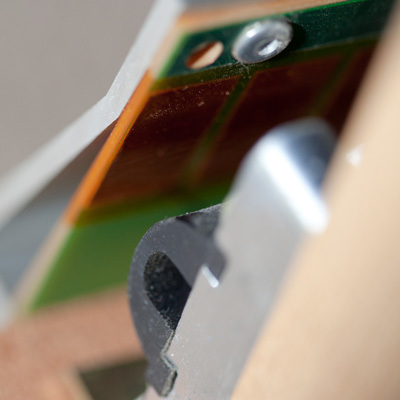 The design of the MIDIboard doesn’t have a “notch” feel like a piano key, the key is a simple lever that mashes into the contact. The feel is closer to a Rhodes than a piano. The rubber “hammer” contacts the sensor, and when you press harder you get more rubber on the sensor and more pressure data. The cool thing about this sensor is that it starts sending pressure data as soon as you press a key. Most synths have a ribbon inside that only starts sending pressure when you mash on the key pretty hard, so the range of expression is small. With the MIDIboard the pressure range is very wide, and the addition of polyphonic aftertouch makes it the best pressure sensing I’ve ever played. Many of my favorite soft synths like NI Kontakt, U-He Diva and Zebra 2 support poly aftertouch. The next challenge is convincing sample library companies to support Poly Aftertouch as a mod source. Is a MIDIboard right for you? Well, it was a project to refurbish and modify this one to what I wanted. But if you want poly aftertouch then there are no currently-available controllers that output this. If I didn’t need that feature, I might have bought one of the Kawai MP-series digital pianos. But I’m glad I went this route – playing CS-80 Bladerunner leads in Zebra is really fun and I love the feel of the keyboard. A few years ago I acquired a damaged Midiboard. I’ve repaired all the electronics and have been using it delightedly. I like it for similar reasons as you. The physical keyboard needs some more work. I get double triggers from key bounce and several keys while functional, are badly chipped, etc. Do you have any resources for replacement parts, like bushings etc.? 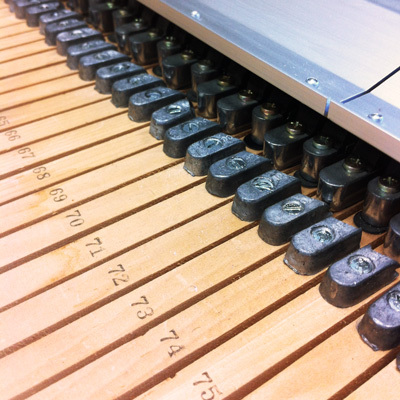 I liked the photo of the weights on the keys. Good idea. Would like to get those as well. Thank you! I also get the double-triggers. Not sure how to fix that. 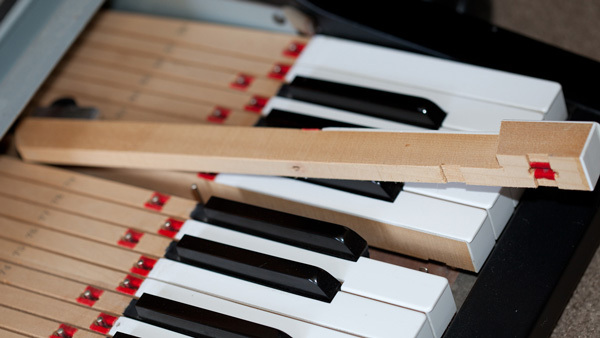 I had the action restored by a piano technician, the bushings/wood keys are similar to what’s in a piano. No idea where to find parts besides Advanced Electronics in LA.